File this under "you read it first on e-Literate". 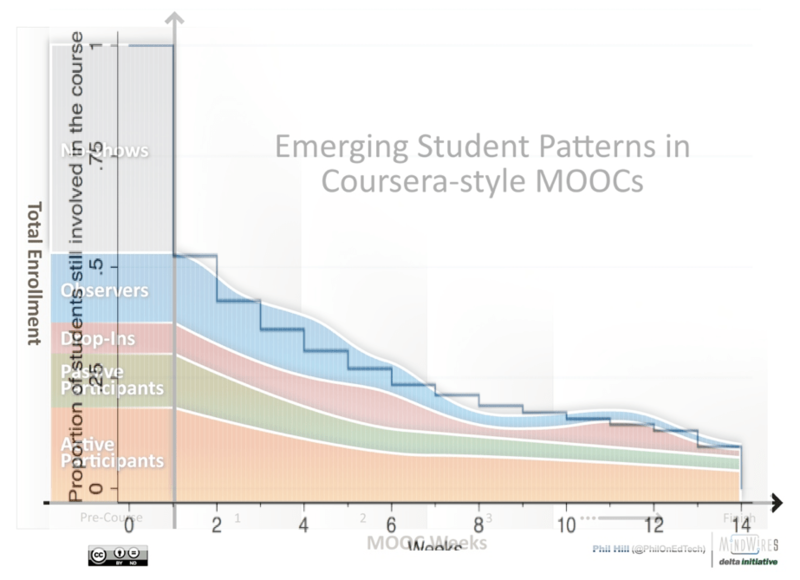 In previous posts from spring 2013 I provided a graphical view on MOOC student patterns based on observed retention over time as well as differing student types. This graphic was based on anecdotal observations of multiple MOOCs, mostly through Coursera. 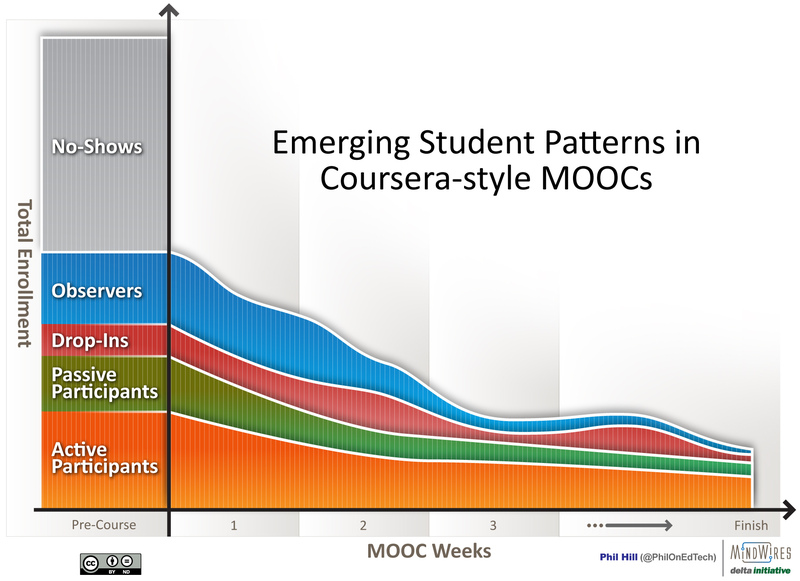 Based on a recent study of the edX Circuits and Electronics MOOC, there is this interesting chart of student patterns based on actual data analysis of the 155k students from the spring 2012 offering of this course. 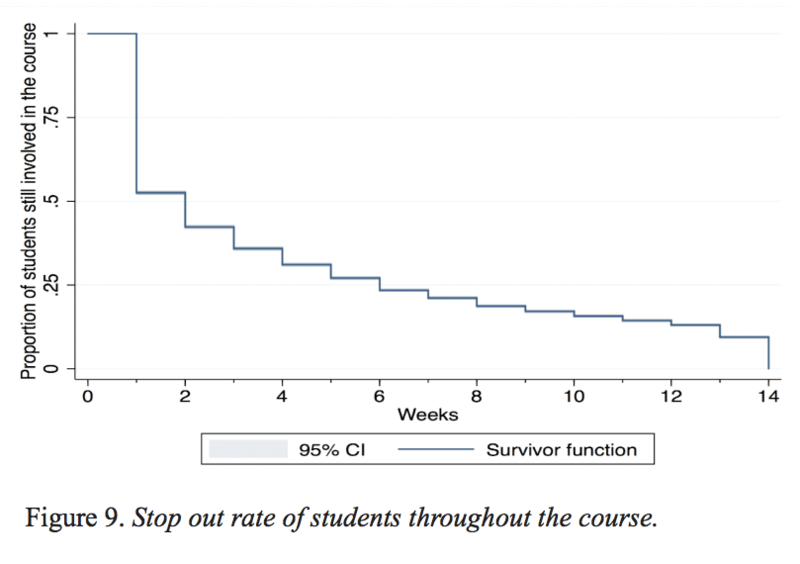 The full report is worth reading, by the way, with some real student pattern insights. I took this chart and overlaid it on the MOOC student patterns graphic, scaling for 0% / 100% of enrollment vertically and start / stop of course horizontally. It's good to see this validation of the overall retention pattern based on real data analysis to augment the original graphic's model. I like the idea that over time, as more data comes in, we can get a more realistic picture of just what is going on in these classes. pattern will be completely different . I estimate at most 20 % drop outs. But also 5,000 -10,000 students per course for credits paying $ 50 or so per course. 50-60 % credit earners . Let’s hope that the MOOC Research Initiative (note: I’m on steering committee) leads to much better data in December. Muvaffak, I would assume that the for-credit status of MOOCs as well as skin-in-the-game (fees paid) would change the student patterns, as you describe. The SJSU study is due out next week – this might give some insight. John, I did see that Stanford study and liked the use of clustering. That approach allowed them to follow the data rather than have the strong pre-conceptions as my approach did. That said, the patterns they found (auditing, completing, disengaging, sampling) have some correlations to (observers, active participants, drop-outs, drop-ins). The biggest difference I saw was that their auditing cluster seems to be a combination of my observers / passive participants. But, I might want to also change my definitions to be closer to the Stanford clusters, which have some more validity. Wow – excellent analysis on the lack of transparency Phil…much more thorough than what I had to say!